Papo Tyrannosaurus Rex - commonly abbreviated to just T-Rex is easily one of the most recognizable dinosaurs of all. The T-Rex was one of the largest known land predators of its time, measuring up to 40 feet long, and weighing in at around 9 tons. The T-Rex could crush its prey with it's 4 foot long jaw and its thick, heavy skull making him one ferocious dino. The Papo Tyrannosaurus Rex has been painstakingly hand-painted, with an extraordinary amount of detail being sculpted and painted. It features a hinged lower jaw, allowing the mouth to be open and closed. 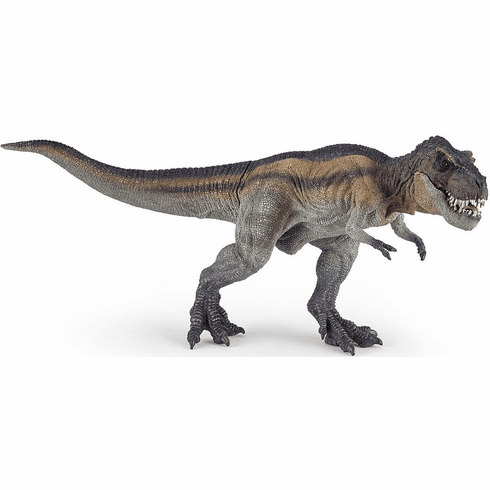 This particular Tyrannosaurus Rex has been posed to look like he is running or walking forward. The Papo T-Rex Running stands approximately 5 inches tall and 12 inches long. This figure is hand painted.